Learn how to make Paneer Kofta which is an authentic North Indian yet Punjabi dish. 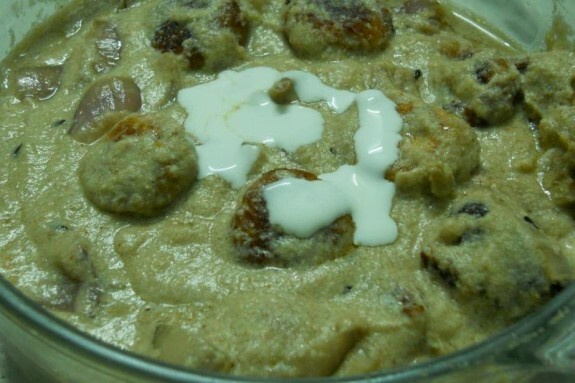 Paneer dumplings cooked in cashew nit gravy makes this recipe super tasty. 1. Add corn flour and salt in the paneer and mash them smoothly. 2. Now take a boil and add salt, pinch of turmeric powder, amchur powder, finely chopped cashew nuts, green chili, ginger, coriander powder and mix them properly with the potatoes. Knead all the items to make dough. 3. Make 12-14 paneer balls and potato balls also. 4. Now take one by one panel balls in your palm, make a dent on the balls with your finger and stuff it with the potato mixture. Wrap them from all the sides and give round shaped of all the paneer balls. Keep them all n refrigerator for few minutes. 5. Now heat oil in a pan and add 4-5 koftas on the pan at a time. Fry them till they are golden brown in colour. Take them out on a plate and rinse the excess oil in tissue. Fry rest of the Koftas in same way. 1. Add tomato, green chili, soaked cashew nuts and ginger into a mixer to make a smooth paste. You can add little water also. 2. Heat oil in a pan and add cumin seeds, clove, and cinnamon. Saute for approximate 15-20 seconds. 3. Now add crushed ginger garlic and again sauté for 10 seconds. 4. Add chopped green chili, onion and sauté it until onions are light brown in colour. 5. Add the mix tomato puree. 6. Now add pinch of turmeric powder, red chilli powder, coriander powder, garam masala powder, salt and sugar. Mix all the ingredients properly and stir it for 1 min. 7. Add kasuri methi and ½ cup warm water. Cook the gravy for 4-5 mins more. 8. Now add the fried stuffed paneer ball and mix it with the gravy well. 9. Remove the flame and serve it hot. You can garnish it with fresh cream or kaju paste on top.